Shaku Atre: What is Business Intelligence? Tony Shaw, Chairman of Wilshire Conferences, interviewed Shaku Atre, co-author of the book "Business Intelligence Roadmap: The Complete Project Lifecycle for Decision-Support Applications", with Larissa Moss, published in February 2003 by Addison Wesley. Tony Q1: I know you�ve been actively engaged in the Business Intelligence area recently, so let�s talk about that. Frankly, ever since the term emerged a couple of years ago, I�ve been suspicious that much of the marketing buzz about BI is a repackaging of old decision support and management reporting concepts that have been around for years. I mean, isn�t it still just about measuring business performance? Can you please define "BI", as you see it, and why I might be wrong in my cynicism? Shaku's Response: Tony, I think your cynicism is somewhat justified. But I think because of the "computer savvy" of knowledge workers today, it�s difficult to just "repackage old stuff", rename it and sell it. Business Intelligence (BI) is much more than "old decision support and management reporting concepts". I would define BI as business success realized through rapid and easy access to actionable information through timely and accurate insight into business conditions about customers, finances, and market conditions. Most of our computerized systems were developed to improve the business processes. Automation of the business processes gave birth to most of the Online Transaction Processing (OLTP) systems. Most of the organizations today have automated the relevant business processes. What is then the differentiator? It is the decision helping systems such as ERP (Enterprise Resource Planning), CRM (Customer Relationship Management), Knowledge Management, Supply Chain Management (SCM) and Portals � to name a few. Most computerized systems have two major components: OLTP and OLAP (Online Analytical Processing). The approaches are different. And as such they need to be treated differently. And what this means then is that BI is much more than �old decision support and management reporting concepts�. BI is a combination of Data Warehouse (DW), CRM (Customer Relationship Management), ERP (Enterprise Resource Planning), SCM (Supply Chain Management), Portals, eProcurement and the likes. And in order to visualize, predict and present the �Business Intelligence� we use various types of querying and reporting mechanisms. Data Mining is another discipline that is used to provide BI. Tony Q2: OK, I�ll buy it�it�s not your father�s analytical platform. Let me get your view on one of the age-old semantic debates of IT, extended now for the emergence of BI � How are data, information, intelligence, and business intelligence interrelated? Storing of data is important but what is more important than that is retrieving it when one needs it � easily and efficiently. - Which group of customers buys which products? of these products by these customers? - How can the marketing dept. advertise other products to these customers? 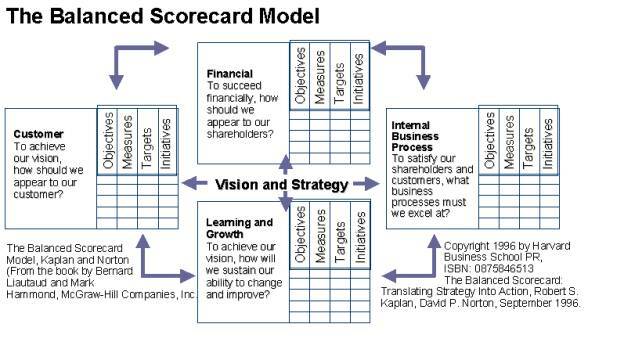 Business Intelligence: Intelligence based on business information, past actions and options available for the future. To that I would add that you can�t talk about these concepts without also talking about Information Value. And Information Value is proportional to the number of knowledge workers using the information. Bob Metcalfe, the inventor of Ethernet, developed a formula for computing the value of a network. He said that Network Value is n-squared � that is, it�s proportional to (The number of connected units) squared. Similarly, Information Value is proportional to (the number of knowledge workers using the information) squared. 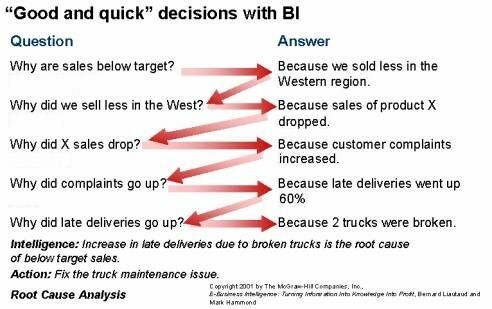 I think this diagram makes the point well, about how to make �good and quick� decisions by using BI technology. Tony Q3: I want to ask you some practical questions from your recent consulting work. Tell me please about the work you�ve been doing in the BI area recently? Shaku's Response: I have been working with a number of Fortune 200 companies to plan, design and implement BI systems. And I am also working with a number of vendors in helping them with their strategies with their BI systems. Tony Q4: So you�re seeing the issues from both sides of the purchase decision. Tell me, where does BI �start�? Does the demand for BI come from the functional departments � the marketing, financial, and manufacturing folks? Or is there a push coming from IT? Shaku's Response: BI usually starts from the requests of the functional departments. Marketing, Sales, Financial, Manufacturing. Knowledge workers like to have �actionable information� in timely fashion. The requirements are usually not created by the IT departments. Tony Q5: What are the big issues, or the critical success factors, in BI projects? Where do they most commonly break down? Lack of understanding of the complexity of BI projects. Lack of recognizing BI projects as cross-organizational business initiatives and not understanding that cross-organizational initiatives are different from stand-alone solutions. Unengaged business sponsors or business sponsors who have little or no authority due to their low-level positions within the organization. Lack of skilled and available staff as well as suboptimum staff utilization. Inappropriate project team structure and dynamics. No business analysis and no standardization activities. No appreciation of the impact of dirty data on business profitability. No understanding of the necessity for and the usage of meta data. Tony Q6: Conversely then, where do they most often pay off? Are there areas that most often seem to produce reliable payback (in whatever terms you choose to measure them, like direct financial ROI, or executive satisfaction)? Tony Q7: Are you seeing much custom application development, or is it all off-the-shelf software now? What about packaged software � the big ERP and CRM systems? Do they really have the BI capabilities that most customers want? Shaku's Response: Most of the organizations try to use �off-the-shelf� software as much as they can. And if off-the-shelf software doesn�t provide what they need, they try to �customize�. Big ERP systems such as i2, J.D. Edwards, Lawson, Oracle, PeopleSoft and SAP, just to name a few, as well as the CRM systems such as Siebel, PeopleSoft, SAP, E.phifany/Octane, NCR, Xchange, have a number of BI capabilities as required by the knowledge workers. Tony Q8: What sort of questions are �data people� asking you? What are the specific interests of the data managers? How to prove ROI, before the BI applications are implemented? Once again, this is not a difficult question to answer only for the BI applications. But it is a difficult question to answer for almost any application. Some applications provide ROI immediately. Applications such as �Fraud Detection� for telephone companies and for credit card businesses are one example. Finding reasons for the attrition of customers and avoiding that from happening is another area which pays off handsomely. Also keeping inventory at a low level so that not much capital is �locked up �in the inventory pays off. It is difficult to prove ROI for �faster, better �decisions. There has to be a specific tangible result to estimate ROI before implementing a BI application. How to integrate our existing legacy systems? We have no documentation, we don�t know how many places same data is stored, how consistent it is etc. Once again, this is not only a BI specific question. For integrating the legacy systems some off-the-shelf interfaces are used. In some instances extracts are taken and stored in relational systems. Interfaces such as ODBC,JDBC are used. Sometimes customized applications need to be developed. · Where do we get the information we need for making decisions today? · What information do we already have? What additional information do we need? · What are the business drivers for an overall BI decision-support initiative? · What are the specific business drivers for this BI application? · Who could be a potential business sponsor? · Do we already have a business sponsor for this BI application? · Are we ready for a BI decision-support environment? · Have we performed a readiness assessment? · What do we need to do to get ready? Buy hardware? Acquire tools? Establish standards? Hire more staff? · What are the risks of building a BI decision-support environment? · What are the risks of not building a BI decision-support environment? · Is it worth building this BI application, or will it cost more than we can justify? · Do we know what all the BI project costs will be? · Will we have to buy new hardware? Upgrade our network? Buy new tools? Hire consultants? · Will the BI application have an effect on our customer service? · Will it help us increase customer satisfaction? · Will it help us increase our revenue? · Will it help us make strategic decisions that will lead to increased profits? · Will it help us reduce our costs? · Can we expect to gain a bigger market share as a result of the BI application? Tony Q9: Are data managers sufficiently involved in the design and delivery of BI systems? And if not, how can or should they get closer to the action? Shaku's Response: Data managers are somewhat involved in the design and delivery of BI systems. There is still a �chasm� between the data managers/IT and the Marketing, Sales, Financial, Manufacturing departments � so called Knowledge Workers of an organization. But I see that the �chasm� is closing in because the knowledge workers are getting more and more computer savvy. But the data managers still have to learn more about the business, how business works the way it does, what are the processes, how could BI systems assist with �actionable information�. Tony Q10: It seems to me that business intelligence should be a growth area for IT right now, given that it leverages existing IT assets� namely the information that resides in corporate databases � at relatively low marginal cost. Is this a reasonable analysis, and is it in fact what�s happening out there in IT shops? Shaku's Response: You are absolutely right. Business Intelligence should leverage existing information that resides in corporate databases. IT shops are paying attention to BI more carefully than they did a few years ago. This could be IT�s big chance to have teamwork with the knowledge workers as well as the �top brass� of the organizations. And by doing a good job, they can shine and get noticed by the top brass. Tony Q11: What do you predict are the major trends for the future? Where does BI head next? Shaku's Response: The management of unstructured data is recognized as one of the major unsolved problems in the Information Technology industry. And BI technology may expand in the area of Unstructured Data. Shaku is one of the unique personalities of the IT industry. Educated in India and Germany, she speaks five languages and has taught all over the world. She worked at IBM for fourteen years, including the prestigious IBM Systems Research Institute, before branching out on her own. Her consulting firm was subsequently purchased by PriceWaterhouse Coopers. During the 1980s - the nascent years of the relational database business - Shaku made a name for herself as both a technical educator and as an analyst of the industry. Her willingness to speak frankly, and her early success as an independent female business owner in the competitive IT industry, have brought her widespread recognition and acknowledgement. Her award-winning book on database management systems, "Data Base: Structured Techniques for Design, Performance and Management" (John Wiley and Sons, New York) has become a classic on the subject. Shaku continues to write extensively, both as a frequent contributor to various trade magazines and webzines, and as the author of the book "Business Intelligence Roadmap: The Complete Project Lifecycle for Decision-Support Applications", co-authored with Larissa Moss, and published in February 2003 (Addison Wesley). Tony is the Chairman of Wilshire Conferences. He has a rich variety of experience in the information services and technology consulting industries. Tony is a co-founder of Wilshire Conferences, based in Los Angeles, where he manages all the content for Wilshire's conference programs and newsletters, primarily in the areas of large-scale corporate data management. Prior to Wilshire, he founded an Internet start-up called BigID.com, specializing in digital identity services. Before this entrepreneurial spurt, Tony was the President of Technology Transfer Institute (TTI)/Vanguard, a world-class research and advisory service based in Santa Monica, California. He led Vanguard's advanced technology futures program. He continues today as the Chief Facilitator of Vanguard's meetings and provides ongoing advice to TTI clients on how to incorporate cutting-edge technologies into their business strategies. Tony has a Bachelor of Commerce degree from the University of New South Wales, in Sydney, Australia. The home page for Wilshire Conferences is http://www.wilshireconferences.com. You can contact Tony by email at tony@wilshireconferences.com. Shaw, T., "Shaku Atre Interview: What is Business Intelligence? ", DSSResources.COM, 07/09/2004. Shaku Atre and Tony Shaw had an opportunity to review the final version of this interview prior to publication. A version of this interview originally appeared in Data Discussions presented by Wilshire Conferences at http://www.wilshireconferences.com/interviews/atre.htm. Tony Shaw provided permission to post this interview at DSSResources.COM on May 4, 2004. Shaku Atre provided final permission with revisions on Monday, June 7, 2004. The interview was posted at DSSResources.COM on Friday, July 9, 2004.